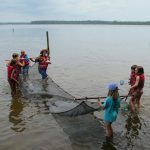 A group of 16 campers spent three days exploring Hammocks Beach State Park for Coastal Discovery Camp, where they took in the many views of the park and learned about its many habitats. 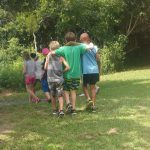 The North Carolina Coastal Federation led the camp from July 11-13, 2016 in partnership with staff at the park, including Sarah Bartlett, the environmental education intern with the park and the federation. 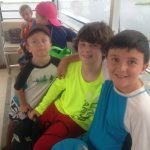 The group began the week with a coastal cruise aboard the Lady Swan to Jones Island where they learned about estuaries and stormwater runoff. 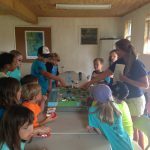 The group participated in a stormwater runoff activity with Bree Tillett, coastal fellow for the federation, who used a watershed model to help the kids visualize the movement of pollutants that move over land and into waterways during rain events. 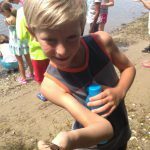 The afternoon was spent exploring a living shoreline using a seine net, where the campers were able to see the various inhabitants of the island’s living shorelines that the federation built. They also participated in a living shorelines activity with Rachel Bisesi, education coordinator for the federation. The activity sets up four model shorelines: one with sand, one with a bulkhead, one with marsh grass and one with a combination of marsh grass and oyster bags. 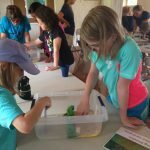 The activity shows the campers how the various shorelines impact wave energy. 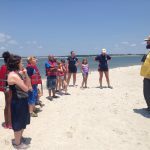 The group learned that living shorelines that have marsh grass and oysters are a more effective and natural way to prevent shoreline erosion. 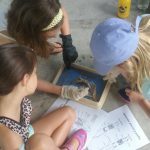 On Tuesday, the campers performed a squid dissection and plankton exploration. 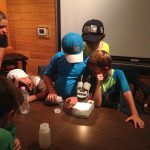 With Bartlett, the group caught plankton in special nets and observed them under a microscope. The afternoon kicked off with a cruise to the point at Bear Island where they used the seine net again, and interns for the park showed them what shorebird eggs look like. This was an important lesson, as some beaches at the park are home to nesting shorebirds. While many of these areas are protected, the eggs blend in with the sand, so it’s important for beachgoers to watch their steps at these important, protected areas. Tillett said the group particularly enjoyed the trip to the point, because they were able to find a lot of interesting creatures in the seine nets, including a whelk. 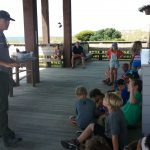 On Wednesday, a Hammocks Beach park ranger led a fish printing activity. 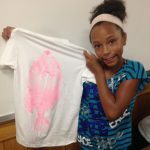 The group used fish and paint to customize their own t-shirts. The ranger also led a turtle lesson. They learned about four main habitats of a barrier island: beaches, sand dunes, maritime forests and salt marsh. Bisesi said all of the activities throughout the week got thumbs up from the campers because they found the park activities to be exciting. They liked being outdoors and getting to see the habitats for themselves. 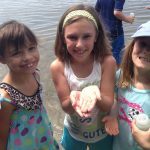 “The students were so fun and genuinely interested in learning more about our coast. Throughout the week we explored the various habitats at the park and talked about ways to keep the coast clean and healthy,” Bisesi said. 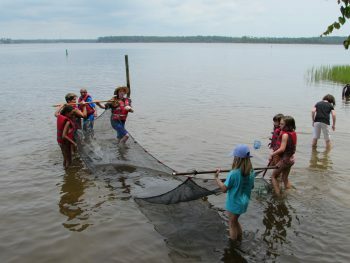 Coastal Discovery Camp would not have been possible without the generosity of the following sponsors: Walmart Neighborhood Market, Croatan Group of the North Carolina Sierra Club, Albemarle-Pamlico National Estuary Partnership (APNEP), Carteret-Craven Electric Cooperative and the Carlson Family Foundation. “I am so thankful to everyone at Hammocks Beach State Park, Lady Swan Boat Tours and to all of the sponsors who made this week possible,” Bisesi said. Check out some of the highlights from the week! Aboard the Lady Swan for a trip to Jones Island!